“Friendship through Art can and will change the World”. The International Art Exhibition titled “Friendship through Art can change the World” will take place in the grounds of Technopolis in Gazi, from the 1st to the 15th of September 2010. Over 250 artists from 50 countries around the world will participate in the event and exhibit their artworks. The exhibition does not have a commercial purpose. The International Art Exhibition is realized under the aegis of the Ministry of Culture and the Cultural Organization of the City of Athens. The Exhibition is an ambitious project that actually began 30 years ago, when the Center of Arts 4 Seasons was founded by professor, artist and modern philosopher, Takis Alexiou. The main idea of the project was to create an international community of conscientious artists, who were determined to change the world peacefully by creating bonds of true friendship amongst them. Many events were held in those thirty years, at both domestic and international level, such as the International Cavafy award, conferences and seminars, exhibitions, publications and productions, collaborations with foreign universities, the UNESCO and Non-Governmental Organizations, and the International Art Painting Exhibition that was held in Rhodes in 2009. The construction of the Center of Arts 4 Seasons was completed in 1990. The Center is located amidst an 10,000m2 olive grove and features an exhibition area, a library, an outdoor theatre (108 seats) an atrium and guest accommodation. 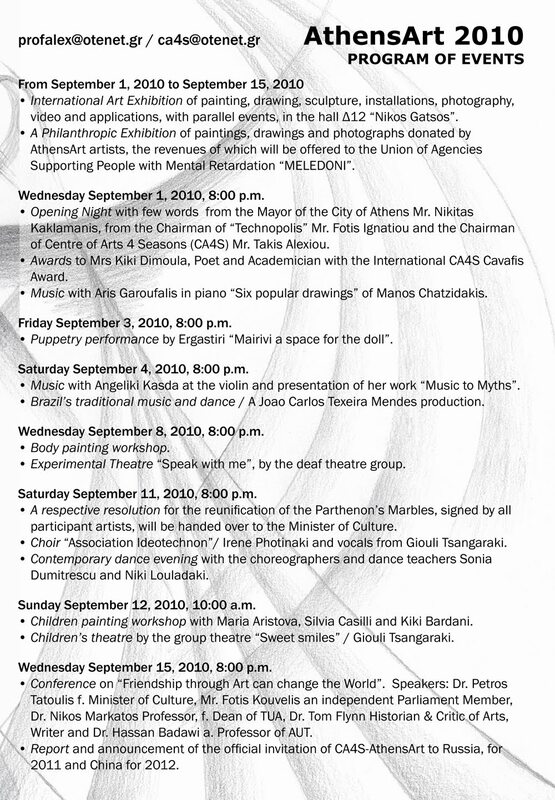 The International Art Exhibition ‘AthensArt 2010’ constitutes the first step towards the establishment of an institution. The City of St. Petersburg has submitted an official bid to host the event in 2011, the Chinese city Suzhou in 2012, while in 2013 the exhibition will return to its birthplace in Athens. The goal of the exhibition being held in various cities around the world is to return to its birthplace always enriched and enhanced. Mr. Takis Alexiou replies positively and with fervour to the question “Can Art change the world?” in the first pages of the rich and exquisitely designed exhibition catalogue. Mr. Alexiou says “there are two totally different ways to reply to this controversial question” and he continues, “The first way focuses mainly on the climate change and the second on human evolution. In the first case we attempt to change climate conditions in order to save the planet, upholding the same commercial aesthetics, which this time is called green. This way art succumbs to the laws of a catastrophic economy and a cruel society. In the second case, we attempt to change the way our brain works and our relationships through a human aesthetics, which will eventually create a better World in which we can live and enjoy Life. Here Art is defined by the laws of human evolution and more particularly by Life itself, in other words, by positive feelings of Friendship and Love!”. Participant artists: Hamidullin, Alessia Babrow, Alessia Zolfo, Alexandra Klein, Alexis Duque, Amel Djenidi, Anatoly Egorov, Andrea Mattiello, Andreina Guerrieri, Andrés Alberto Aguiar Achi, Andri Josef, Angela Consoli, Angelika Spoeri, Angeliki Korkou, Anna Ferri, Anna Maria Saviano, Anna Zayidova, Annika Sporleder, Antonio Civitarese, Antonietta Montemurro, Astrid Kruger, Baltus Wigersma, Barbara Marcucci, Bassey Ndon, Branislava Nikolic, Bruno Greco, Carlotta Castelletti, Caterina Arcuri, Charli Lindsay, Chiara Pini, Chiara Valentini, Chris Bishop, Christos Macherides, Cinzia Fresia, Collettivo De Mitri, Daria Cornea, Dario Manco, Diana Hoding, Dimitrios Bakas, Dimitris Strouzakis, Donato Lotito, Efsevia Mihailidou, Elena Bolgova, Elena Candoli, Elena Osterwalder, Eleni Berberidou, Eleni Koroneou-Katsoula, Eleni Sishaki, Elidia Kreutzer, Emily Eunjue Hayes, Ernesto Ferriol, Esther Burger, Eva Fellner, Eva Vevere, Filli Cusenza, Marcella Fusco, Francesca Arsi, Gunter Schickert & Frauke Helwes, Georgia Kitsiou, Gheorghe Zaharia, Gianni Bailo,Giovanni Battista Sciello, Giorgio Carluccio, Giovanna D’Angelo, Giovanni Alfonsetti, Giselle Diaz Campagna, Giulia Janach, Giulio De Mitri, Giuseppe Teobaldelli, Go Flores, Guy Noble, Helen Moulinos, Hengameh Farahmand, Irene Dipre, Irene Petrafresa, Irene Papaioannou, Jake Eldridge, Joas Sebastian Nebe, Joanna Tijs, Joseph Grigorios el Jamous, Juan Alberto Negroni, Karin Angele, Katerina Mourati, Katia Varvaki, Khairy Hirzallah, Kiki Bardani, Laura Pozzar, Longueville Laurence, Lee Mc Donald, Marie-Pierre Legrand, Lilika Pantzopoulou, Litsa Marandi, Luca Pontrandolfo, Lucilla Campioni, Lusine Breitscheidel, Madeleine Strindberg, Madina Ziganshina, Magdalene Theocharis, Magdalini Birbili, Mahnaz Dustikhah, Machmout Vagapov, Mandra Cerrone, Manousos Nanakis, Manuel Giacometti, Manuela Nicolini, Margherita Levo Rosenberg, Margit Hartleb, Maria Aristova, Maria Karalouka, Maria Luisa Imperiali, Maria Martinelli, Maria Pesmazoglou, Maria Xenouli, Mariel Bisschops, Marilena Vita, Mario Fois, Marios Trichas, Marjolein Wortmann, Martha Fyrigos, Mary Cinque, Masaki Yada, Stefanos Matthias, Melissa Alvarado, Michael Horne, Mirek Antoniewicz, Mirela Traistaru, Michail Jarovoj, Monia Tartarini, Mr. Mike, Nadia Sabbioni, Natalia Mramorova, Nicola Mastroserio, Nicoletta Casali, Nikos Kyristis, Nikos Rigas, Norberto tedesco, Noura El Kordy, Oleg Yakhnin, Olga Plastira, Ostad Mahmoud Helmi, Pamela Longobardi, Panagiotis Voulgaris, Paola Adamo, Paola Adornato, Paolo Tinella, Patricia Murillo, Paulo R. C. Barros, Piero Ferroglia, Pierre Chirouze, Pio Schena, Polyxene Kasda, Roberta Vivoli, Sabrina Tomasella, Sacha Janzee, Sanda D’Angelo, Marisol Fernandez Collando (Sananasnegras), Sebastiano Longaretti, Semeli Tsikritea, Silvia De Gennaro, Silvia Pignat, Varvara Spirouli, Stela Velka, Takis Alexiou, Tammy Duffy, Theofilos Aeginitis, Tita Bonatsou, Tommy Germain, Vasiliki Varvaki, Vassiliki Sofra, Vera Tartaro, Antonis Papantonoiu, Virginia Videa, Yuan Yuan, Konstantina Skapetoulia, Hakan Akçura, Vassilis Papanikolaou, Refugio de la Torre, Sibylle Werner, Despina Papadopoulou, Dev Udaiyan, Hagop Sulahian, Lena Kelekian, Hilda Kelekian, Angela Spoerl, Barbara Lichtman, Aggelika korovessi, Marea Atkinson, Eozen Agopian, Dimitra Bourouliti, Irene Domingez, Elena Chiesa, Irma Villarroel, Julia Guerrero, Katerina Iatropoulou, Anastasia, Eleni Tsotsorou, Nastazia Rigas, Eleni Fokianou, Pol Koukourakis, Andreas Antonos, Vlasta Mijak, Aggelika Korovessi, Marea Atkinson, Eozen Agopian, Dimitra Bourouliti, Irene Domingez, Stavros Pavlidis, Kordonia Mirsini, Eva Glinia, Anastasia Zourantzi, Gintidis Drosos, Antonis Eleftheriadis, Katerina Kostogiannou, Maria Spentza. Damian Mac Con UladhAN ABANDONED Greek village near presentday Izmir (formerly Symrna) in Turkey is the unusual setting for a video art performance by a Turkish artist who wants to contribute to Greek-Turkish understanding and reconciliation. Thistles of Sazak, which runs a little more than 40 minutes, shows Turkish artist Hakan Akçura clearing away the thistles from the ruins of the village of Sazaki (as the Greeks call it). It was inhabited mostly by Greeks until the cataclysmic events of 1922. In that year, following the collapse of the Greek army, the area’s Greeks were driven into the sea, killed or deported, and their villages plundered and destroyed. This occurred even though they “had the same rights to those lands as those who remained”, the artist says. “For me, trying to clear the covering of thistles at Sazak is a symbolic cleansing meant to open the way for rescuing the village from the lonely, derelict, unprotected state in which it has been left together with its painful past,” said the artist from his home in Stockholm, adding that he sees his performance, carried out last summer, as a contribution to Greek-Turkish friendship. Akçura, who released his video online on March 31, says his action was inspired by the visit last year of 50 Greeks to their ancestral homeland on the Karaburun peninsula, on which Sazaki is located. Where once the Sazaki villagers cultivated vineyards, producing wine and molasses, thistles now grow among the ruined shells of the village, which Akçura says was also abandoned by its smaller Turkish community of about a dozen families. Akçura sees the modern form of video art as the ideal medium to help Greeks and Turks confront and engage with their difficult history, which casts a dark cloud over both countries. He says that the expulsions of populations of the 1920s left “a lot of people with hidden or fake identities” on both sides of the Aegean. “Most of them carried their secrets and hopes to the grave. We owe them another future,” he said. His intention of pushing Greeks and Turks to deal with their past stems from his reading of Dido Sotiriou’s Farewell to Anatolia in 1977. Since then, he has participated in a number of artistic events in Greece. A self-described “open flux artist”, Akçura believes in taking an “adverse and radical” approach in order to witness the “essence of time”. Video, he adds, allows for the sharing and wide circulation of artistic creation. Damian Mac Con Uladh: You describe yourself as an “open flux artist”. How do you define that? What is the symbolism behind your action of clearing away the thistles? I have a summer house since 27 years in Karaburun. I have seen the ruins of Sazak several times before but I could go there first last year, before my performance. I have taken a lot of photographs whereever the thistles allowed me. When I tried to find simple, pure line/form for my performance, I thought again about this thistles and decided to clean them for the visitors from Patras. Why didn’t more people – Greeks and Turks – come to the thistle-clearing event? Yes, I thougt about it after the performance and it was a problem for me. I criticized their unsharing being in my blogg side. But now, I can understand them. Whereas they were not volunteers or activists, they were simple villagers from the both sides of the Aegean Sea. They were already nervous and this meeting was the first contact for them. They didnt’t want to confront one another or the past. They want to meet each other, maybe to find similarity and only to breath their grand fathers/mothers ambience . But on my side, I had intention to enforce Turkish and Greece goverments for this kind of confrontations about this forced migration time (1922) and long population exchange period (1923-1930) with my performance and video. I believe in that when I read Dido Sotiriu’s extraordinary novel “Matomena Homata” as a young communist in 1977, I believe in that when I was crying in my first contact with Kayaköy (Λεβισσι, Levissi) as a young artist in 1993, I believe that again when I went to Samotrache (Semadirek) for 2nd Interbalkanic Visual Arts Symposium in 1999 and watched over the “situated” peoples hatred to island, they are originally mountaineers and forced to live there instead of the turk inhabitants. I hope “Thistles of Sazak” starts this late discussion and confrontation between two peoples from both sides before the goverments. What was the effect of the “exchange of populations” for the region? Was the painful past shared by both communities: those expelled and those left behind? Sazak(i)s story was forced migration story before the “exchange of populations” period. Definitly all this stories inferences goes on and does not stop ever for me. When I talked to very old turkish villagers in the surrounding villages about my performance, I didn’t expect to hear their own very lively, clear memories of very bloody and sad stories. Non-confontation is always the reason for not forgetting. I’m sure, a lot of people lived through with the help of their neighbors and lived with own hidden/fake identities on both sides of the Aegean Sea, last 88 years. Maybe most of them died with this secret and hope. We owe them an other future. I also want to add this: I even believe that the way to make Sazak and others a symbol of developing friendship of two peoples, goes through a sincere blending with them, to be participant and confront every wall and every trace together with them rather than just learning, celebrating and watching them.Why did Sazak remain empty when lots of other abandoned villages were repopulated with Muslim refugees from Greece? Because Sazak was subject for early forced migration story. Sazak didn’t even come into the picture on the “exchange of populations” table. Sazak lost own 12-15 turkish families too who lived with their greek neighbors. Although Kayaköy was at that table yet it remained empty : because according to a belief among muslims a cursed place cannot be settled though it brings unluck for future generations: “Where blood has flown no new blood can grow”. I hope same belief is common in Greece too; I like that. Are you in contact with Greek descendants of Karaburun people? The video was on show at the Goethe-Institut in Ankara, from 11-21 (extended to 28) March. What were the reactions of viewers to it? I participated one of the very important video exhibition in 2010 Ankara International Film Festival with my video. “The video: Spaces of Memory” was a video screening and a video display on the features of a 24-piece memory, appeared for the first time before the audience in Turkey. It had been prepared under the direction of the curators of Ege Berensel and Andreas Treske. “Video: Spaces of Memory” collected the works of four artists in the following four memories. Eyes of Memory: Harun Farocki, Collective Memory: Antoni Muntadas, Memory of Water: Genco Gülan and Places of Memory: Hakan Akçura. Harun Farocki, Genco Gülan and I shared our memories, in the workshops to be realized within the framework of FestiLAB. It was very powerful exhibition. Thousands of visitors came and Festival Organization extended the event time with one week. I shared my creativity and “memory” in the 4 hours long workshop with 90 participants and attended the 2 hours long interview at Turkish Radio Televisions Europa FM Channel. Several articles are published about the exhibition and my video. Now, Karaburun Municipality wants to show my video and some of the other videos under the similar subject in special screening program at the Karaburun Festival, August 2010. I will be very happy with all possibilities for screening of my video in Greece too. How can such a modern medium as video help in remembering the historical past? Can a link be established between the video and the art of remembering, “ars memorativa” which was pervasive in the Ancient world and during the Middle Ages then left to the oblivion as the development of press by the 18th century? It was necessary to form “an artificial memory” as the paper was a rare and expensive product in the Middle Ages (I want to remind that Spinoza had only 180 books when he died). Ars memorativa, in other words, mnemotekhne was a mandatory cultural facility in order to improve the capacity of natural memory. The supremacy of the oral culture was penetrating through the petit techniques of the narrators. Imagine that you are illiterate or you do not have a paper and a pen during an important proceeding. The only way is to organize or reorganize your thoughts and memories in an effective way. In this respect, the performers of Ars memorativa developed a discipline in the Middle Ages which they called as “Methods of Places and Images”. We are not able to find an answer to the question that to what extent such a method can be successful in our times in which the things to be remembered surpass extremely the cognitive skills of an average person. However, it is self-evident that people in the Ancient times and the Middle Ages had problems in remembering and were obliged to lead an intellectual life in which “taking notes” were almost impossible. Does video address less to a modern – postmodern person compare to former people? Could its feature of being a high-tech product alienate it from the world of “memory techniques”? Or could it be reinstated in order to respond to a formula of “remembering the remembrance and re-remembering”? It is argued that video is Memory Box (Chris Marker), a Memory-Space (Muntadas, Farocki) or that video is related to a remembering gaze even it imitates the functioning of memory. Marker would say that if remembering is providing a psychic domicile to a wound free from the object, this means remembering the memories of other people is getting injured by their wounds.